Fishguard is a small town and ferry port located on the west coast of Wales. The town faces north and is protected from the Atlantic by the Goodwich peninsular to the west. This location makes an ideal location for a small harbour and port. Ferries cross regularly to Rosslare in southern Ireland. 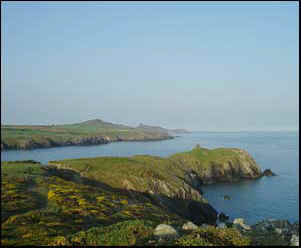 The Pembroke Coast National Park is adjacent to Fishguard which makes it an ideal location from which to explore this spectacular area. 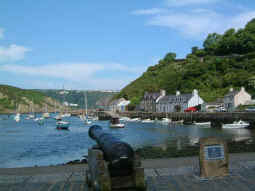 within Fishguard itself there is a pleasant quay area where small cottages crowd in on the waterfront. There are some good cafes and restaurants to wile away the time doing nothing in particular - except admire the view. Some 16 miles along the coast to the west lies St David's, which is a small town with a magnificent cathedral where St David's remains lie. 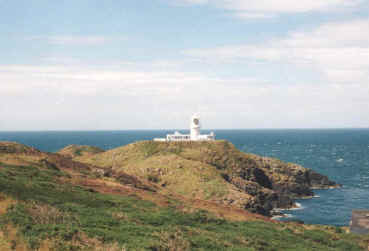 There are spectacular views from St. David's Head across St Brides Bay and towards Ramsey Island, which lies one kilometre off shore and is a nature reserve. To the east of Fishguard you will find Newport, which is a small seaside resort with large, sandy beaches at Parrog and at Newport Sands across the river. Newport was once a thriving port and shipbuilding centre, until trade moved to the south Wales coast at Swansea and Cardiff. Unlikely as it may seem Fishguard was the location of the last invasion of mainland Britain. In 1797 a cheeky gang of 1500 Frenchmen landed at Fishguard with the aim of marching on Liverpool to divert English troops while a larger force attempted to occupy Ireland. Needless to say the French themselves were diverted when they happened on a large cache of vintage wine which they consumed, with predictable results. The local postmistress, aided by a couple of boy scouts rounded up the naughty soldiers and the invasion failed. Well something like that - honest!